Even in the deep south, trunk splitting can be an issue. Many times, it is caused by cold weather setting in, but in the south, it can be caused by quickly fluctuating temperatures between hot and cold. Wind can also damage trunks by splitting. Depending upon the species or cultivar, it could also be damaged by birds. As an example, Birds like the sapsucker love to pick at the trunks of apple trees. A quick growth spurt can also be the cause. Overwatering can create hairline vertical cracks too. Making sure you properly water your shrubs and trees can help, plus do not over∼fertilize. If the trunk is already split in one or more places, you can paint it with slightly watered down latex paint. 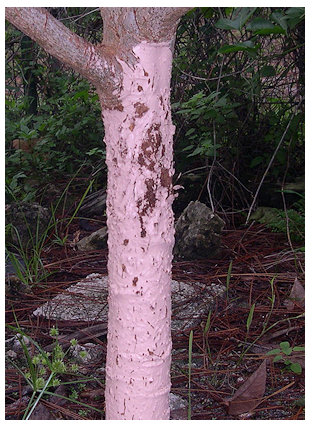 This will help to prevent the tree trunk from getting further fungal damage or disease. The trunk can even be damaged by sun scalding. Painting the trunk is also the solution in this case. Most people choose white latex paint for this problem, as it reflects heat. But a lot of people do not like the horrible way it makes the tree appear. Try a beige paint color instead. It works just as well at reflecting heat, and does not look funny. 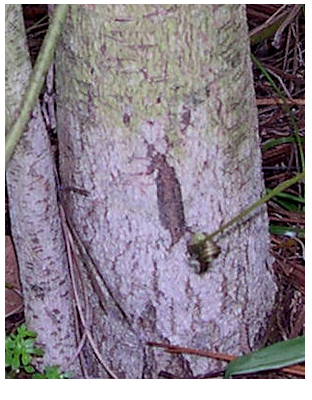 Finally, although it is not &apos;trunk splitting&apos; persay, but squirrels can also damage the trunks of certain trees and shrubs. Painting them also seems to help in this instance. Stem splitting sometimes occurs in brugmansia. It looks terrible, and the first time I saw it I quickly moved the plant from the rest of my collection, in case it was contagious. It grew out this way, alone but still cared for, for over 6 months before I asked another hybridizer what she thought. I took the picture you see, and her expert advice calmed my fears. She said it is not contagious, but does sometimes happen. All one can do is cut out the dead material, and start with the remaining stock. I did as she said, and lo and behold, all of the inside material of the plant was beautiful and green, unaffected.So it was not systemic. I then started new plant cuttings from the unaffected plant tissue. If you see this happening to your brugmansia, do as my friend suggests. Cut this material out, and use remaining healthy tissue as new cutting material. I have noticed that a couple of my cultivars have callused or corky areas on the trunk and some stems. After doing some research on this, and asking a lot of the brugmansia growers over at BGI, I have discovered that it is more naturally occuring in brugmansia than I thought, and nothing to get myself into a fuss about. After reading a Wikipedia article on plant callus, it is just like what you and I get as humans when we get a scratch. Then and our special blood cells, called macrophages, race to the scene through the highway of blood vessels. They then work to coagulate the wound, thus stopping the bleeding. They also form the scab that becomes new skin and locks your skin system back into place, keeping you safe. Callus material in trees and shrubs works significantly in the same fashion. They are wound protectors. If the brugmansia tree is old, it has lived enough seasons to where it may come across such damage. Callus areas then form. 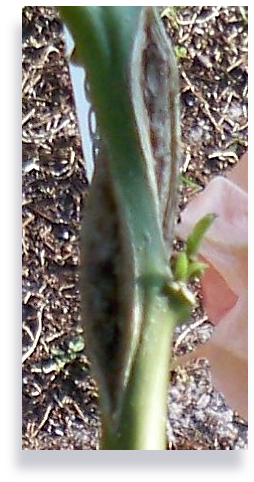 This entry was posted on March 6th, 2012 and is filed under Plant Pathology.